This blog comes courtesy of Vera Blagev, a local artist who has created some truly amazing artwork from this year's harvest. Join us for an exclusive evening with Vera at the vineyard on Thursday 29th November and hear her talk about the inspiration behind her artwork. Limited tickets available now. Albury Vineyard is a jewel in the Surrey Hills. It is an intoxicating combination of beauty and agriculture – both a stunningly scenic place and a place of hard work. Recognized as an area of outstanding natural beauty in southern England, the Surrey Hills is a walker’s and biker’s paradise. Whether its rain, sun or clouds, the scenery of the rolling undulating hills is truly spectacular. This slice of English countryside is a fitting setting for one of England’s finest vineyards – Albury Vineyard, which has been making organic sparkling and still wines for 10 years. Having moved to Surrey this year, I’ve been pleasantly surprised to find such a strong presence of English winemakers locally. Making wine has always seemed like such a magical process full of mystery and romance. From harnessing the power of nature to protecting the vines from the worst of the weather, creating wine in England is a labour of love. To my eyes, the days in Albury Vineyard play with time – the past and the future. Most days at the vineyard are about planning ahead, tending to the vine, thinking of the next year’s harvest. The other days are linking back to years before, reaping the rewards of the harvests of previous years. With each harvest being fundamentally imprinted by a variety of factors that were specific to that year’s crop. And yet, once a year, there is a magical time when everything is focused on a particular moment – when everything and everyone connects to a specific time – the harvest. This year, I was fortunate enough to help out at the harvest and experience for a few short hours what life in this beautiful organic vineyard is truly like during the harvest. I found the actual act of hand picking grapes simultaneously physically tough and mentally soothing. The repetitive nature of harvesting creates a certain calmness in the mind. Being in beautiful nature is always a treat, but it was a particularly special experience on that day. The weather wore many masks but largely cooperated with the task at hand – it started out with an atmospheric fog, which then developed into clouds, and ultimately transformed into bright gleaming sunshine. I found the harvesting process to be almost like active meditation, when you are truly present in the moment and connected to what you are doing. In that moment in time, only the grape matters – nothing else. Helping at the harvest really helped me gain a first hand understanding of the extraordinary care and love that goes into each grape. Each bunch of grapes are precious, have to be handled carefully and transported without being crushed to the place where the wine making process truly begins. The harvest in vineyards across the world is often a highly stressful time that is full of predictions about the weather, discussions about when to start the harvest, and nervously awaiting to find out yields and percentages. And despite all the stress and worry, it is an immensely exciting time when there is a real buzz in the air. When to the common visitor, it’s strikingly clear that vineyards are not there just to have a nice wine tasting and look pretty for our photo opportunities, but to create wine. The elixir that we so prize. This was the genesis of my original artworks to celebrate Albury Vineyard’s best harvest since its founding 10 years ago. I wanted to capture a specific time in the history of Albury Vineyard. But I wanted to go beyond a simple depiction of the vineyard and vines themselves. I wanted to highlight the various elements that intertwine to create fine wine. From the ordered and structured to the natural and organic. 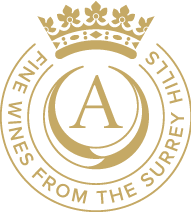 I wanted to bring out the softness of the Surrey Hills that are Albury Vineyard’s home. To celebrate the roundness of plump ripe grapes. But also, I wanted to showcase the almost geometric linear structure of the rows of vines. And to bring in an element of the weather – clouds, sun, rain, sun and moon – that is such a critical force in the life of a vineyard. Each artwork is an original composition created from genuine elements from Albury Vineyard – leaves of the vines, the vines themselves, and the leaf stems. The result is a haunting mix of obviously recognizable leaf shapes alongside more structural elements in the artwork. I wanted to capture a record of this year’s harvest in that moment and to celebrate all the work that goes into making the harvest a success. But above all, to pay homages to the vines themselves - their beauty and strength. By not using colour in my artworks, I wanted to focus on the structure of the vine leaves themselves. Creating art in monochrome enabled me to highlight the linear architecture of the vineyard and bringing out the details of the vine leaves, while creating shadows reminiscent of clouds and weather patterns that leave their imprint on every year’s harvest. And above all, I wanted to create fingerprints of the individual vine leaves that create the grapes. And just like human fingerprints which all might look similar at first glance, but are in truth all highly individual, so are the leaves in the vineyard – simultaneously the same and uniquely different. A few weeks after I helped at the harvest, I met other harvest helpers, Albury Vineyard wine club members and staff at the harvest party. It was there, that I was reminded what a true labour of love wine really is as this year’s harvest will be bottled and monitored carefully for up to three years before it is ever celebrated by wine enthusiast in a glass. Indeed, vineyards play with time. They have a way of making it slow down and speed up again. And as Albury Vineyard’s star grows ever brighter over the coming years on the back of such effort and love, I do wish them (and their vines) all the success in the world.